Did you notice? It has taken me more than two weeks to get to writing and posting this fascinating 12 hour adventure that I highly recommend. 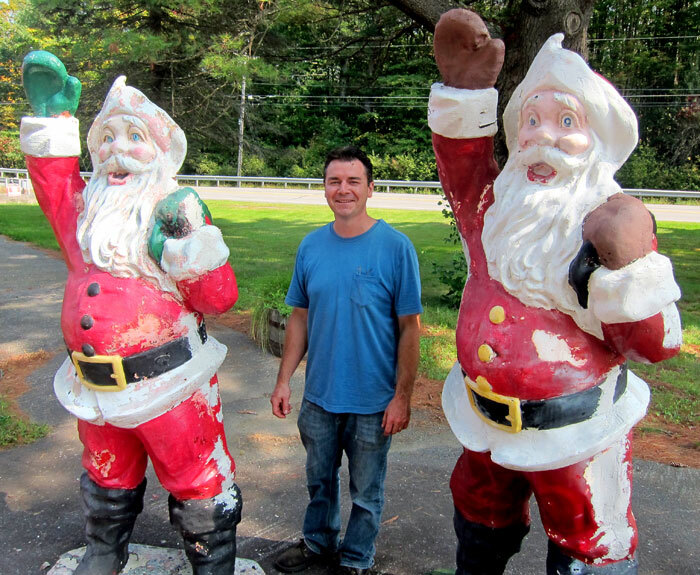 The day before my Quabbin (The Meeting of Many Waters) visit I got to meet the new owner of Santa’s Land in Putney, Vermont. I then updated my Santa’s Land post and made mention on Facebook of the news of its reopening. That lead to over 400 “likes” and over 600 “shares” which in 2 1/2 days equated to over 5,400 page views of that post – AMAZING. And, then it was CLARION time, and I spent 4 days working on the October issue – which is one of the best yet. Where did the rest of the time go? It just goes. 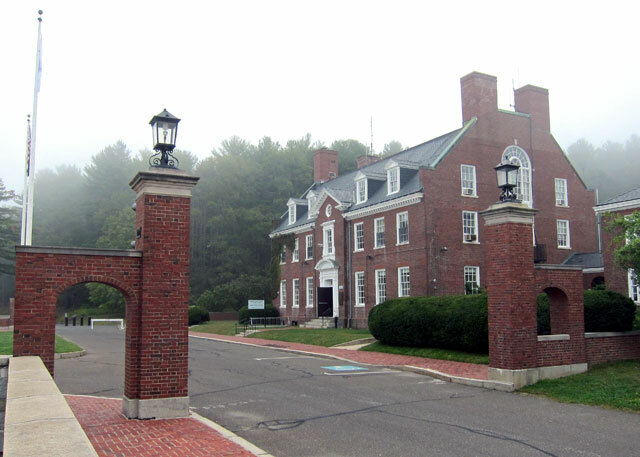 Before I went to Santa’s Land that Saturday, I stopped at the library to “hold court” and mentioning the Quabbin excursion, friend “Skippy” exclaimed, “may I come?” We left a little after 8AM Sunday down I-91, exiting to cut over to Sunderland, Mass, then to Amherst to get Route 9 to Belchertown to continue east the Quabbin Visitor center. 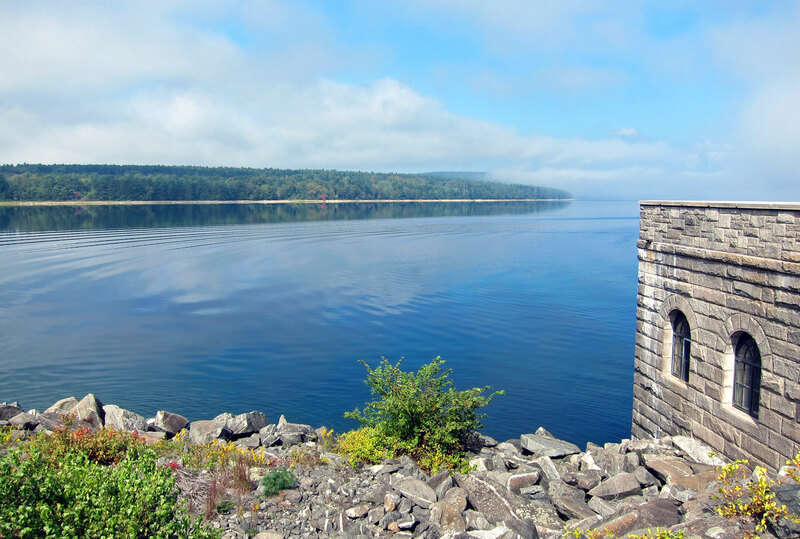 I have always been fascinated with the building of this reservoir that supplies Boston and environs, but I have recently been reading a great book titled WATER FOR GOTHAM about the struggles to get water to New York City – that renewed my desire to explore more at Quabbin (click to open for easier reading). 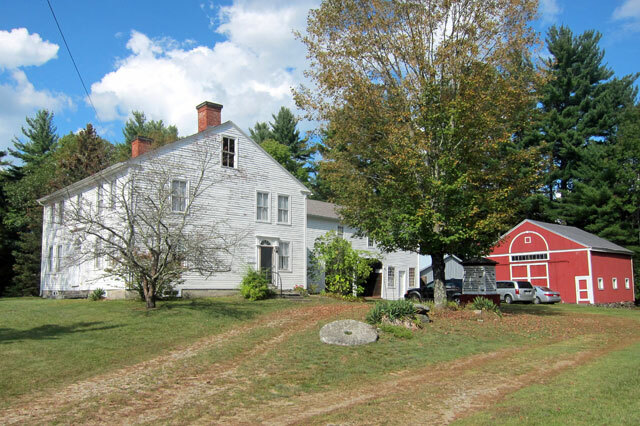 This project, envisioned even in the 1890s, caused four towns to vanish under as much as 150 of water, and many other villages vacated that were in the proposed watershed. Almost 3,000 people were displaced (homes and businesses lost beginning in 1927), and almost 8,000 bodies from cemeteries relocated. Learning from earlier projects, the new reservoir bottom was totally cleared of homes, vegetation, everything for the purest water. 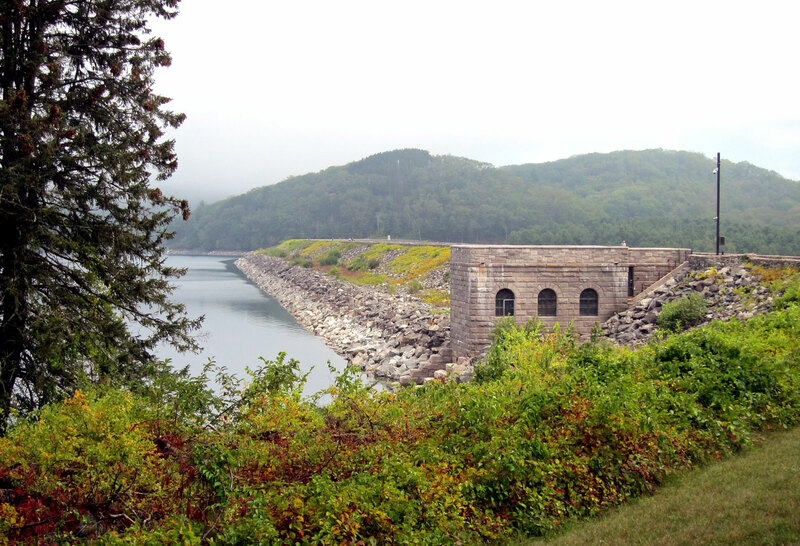 The dam and dike were completed in 1939, and it took 7 years for the reservoir to fill. 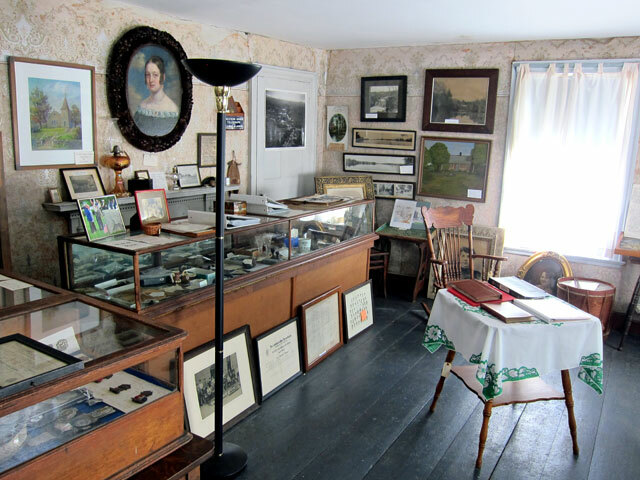 There is a small museum in one room in the Administration building built alongside the dam. What was great in the museum, and make sure you see it, is the introductory video. We saw that, and a second one on the system to move the water to Boston. Upon leaving, the fog was beginning to lift finally, and the reservoir coming into view. Do you see the coyote in the grass towards the left? Do you see him/her? Actually a statue they move around to scare away Canadian Geese flying through. If you have ever seen a gaggle of geese, you know what they leave in great quantity. The plan was originally to have a seaplane housed under the admin building, and there is a ramp into the lake. They never used a plane to patrol the lake, but there are patrol boats, and they use sounds and blanks to encourage birds to continue along. Walking east then to the dam. It was amazing to learn how caissons were sunk down to bedrock (see the video) to construct the dam, and the complicated procedure to create what you see below. The fog finally was starting to lift. Leaving the visitor center we then entered the Middle Gate to loop around a peninsula to the East Gate. 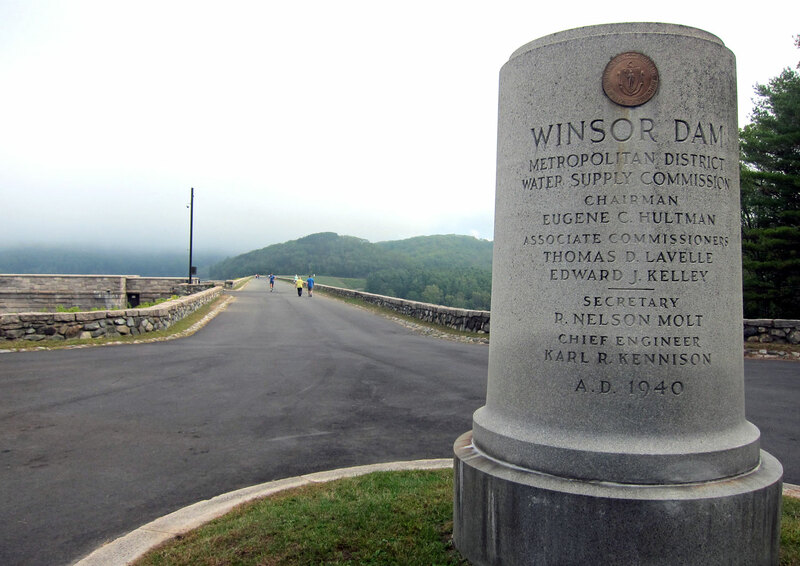 The first stop/view is Winsor Memorial Park (named for the engineer) looking back to the dam. 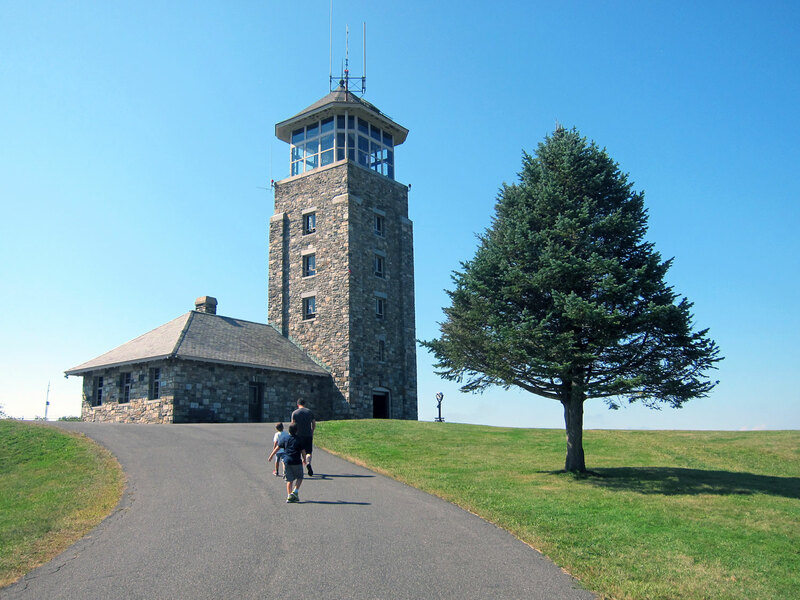 Of course, at the high point is Quabbin Tower so you can get 84 more steps above Terra Firma. 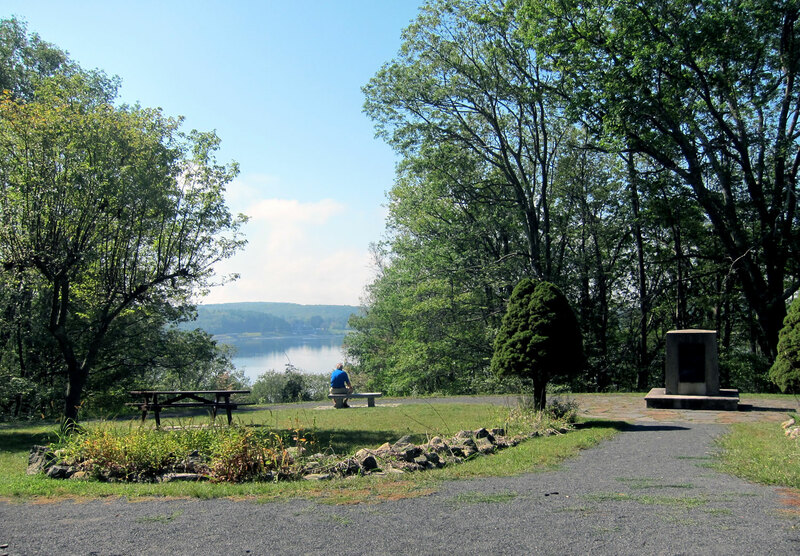 Just outside the East Gate of the park area is the Quabbin Park Cemetery where the remains of 6,601 graves from the Swift River Valley were moved. 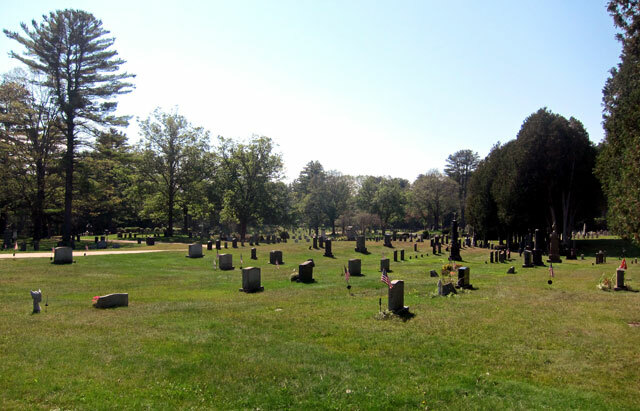 7,613 graves were disinterred from thirty-four cemeteries scattered throughout eight towns, the others relocated elsewhere. 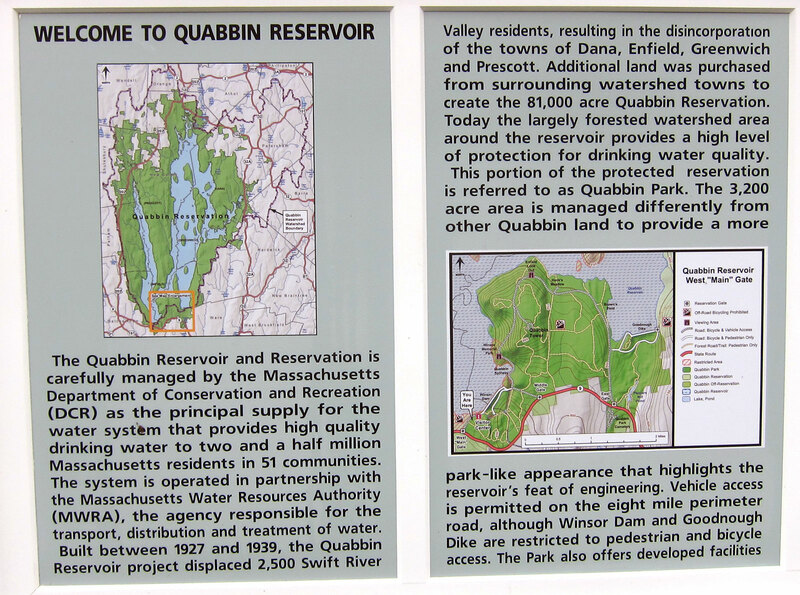 In preparation for this trip I had read my copy (I squirrel books away in my own collection that catch my eye – have not run out of books to sell yet) of QUABBIN: THE ACCIDENTAL WILDERNESS. Just look at a map of Massachusetts, and you will understand. 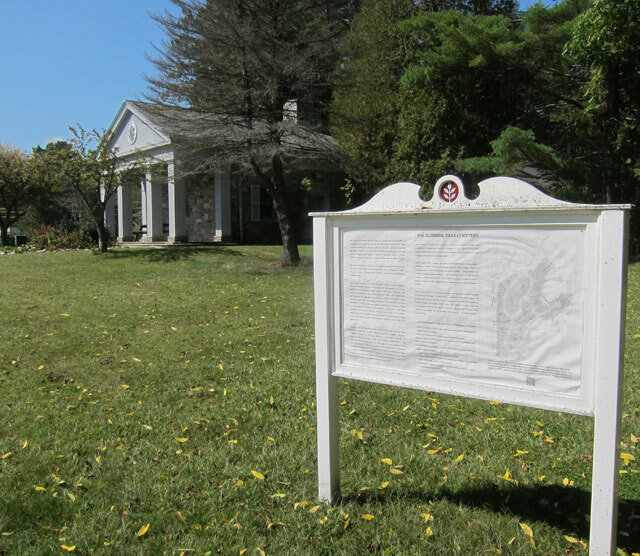 In the book I learned of The Swift River Valley Historical Society – I did not know of it. Open only Wednesday and Sunday afternoons, it closes the end of September for the season. I had to see it. 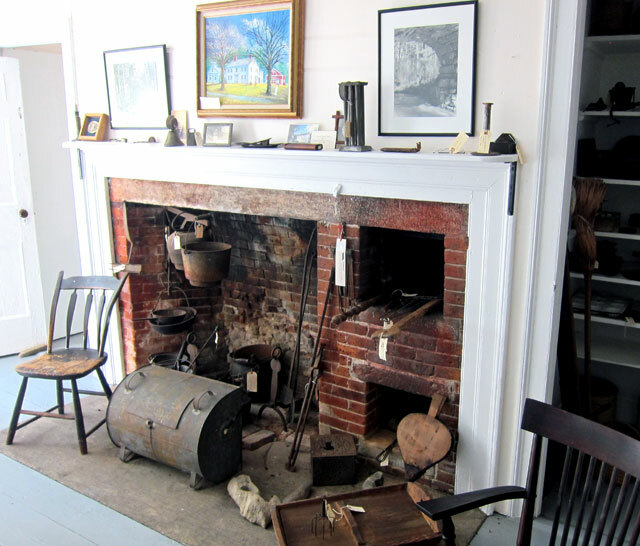 As people were being displaced, the museum had its beginning saving items from the towns of Dana, Enfield, Greenwich and Prescott. 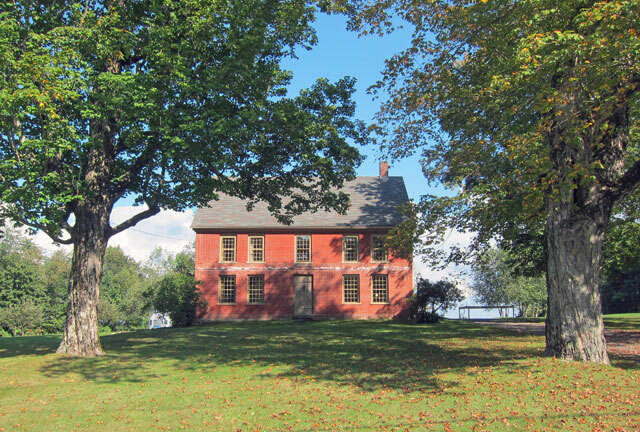 The main museum building, the Whitaker Clary House (built in 1816) was purchased from the Massachusetts District Commission (MDC, now DCR Watershed Division) in 1961 for $1.00. 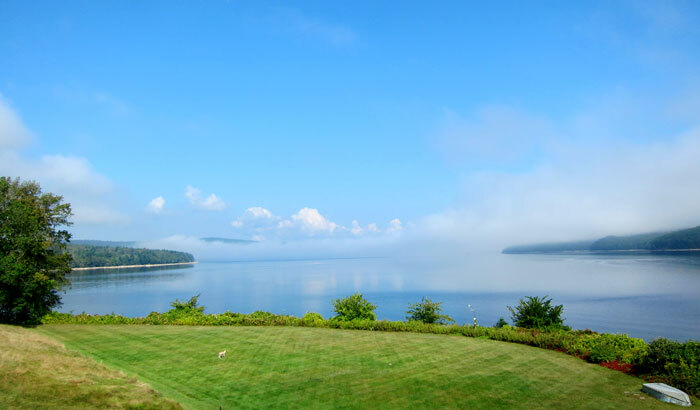 In the Quabbin watershed it was originally planned for destruction, but fortunately that never occurred as the interior is essentially all original – a visual and historic treat. 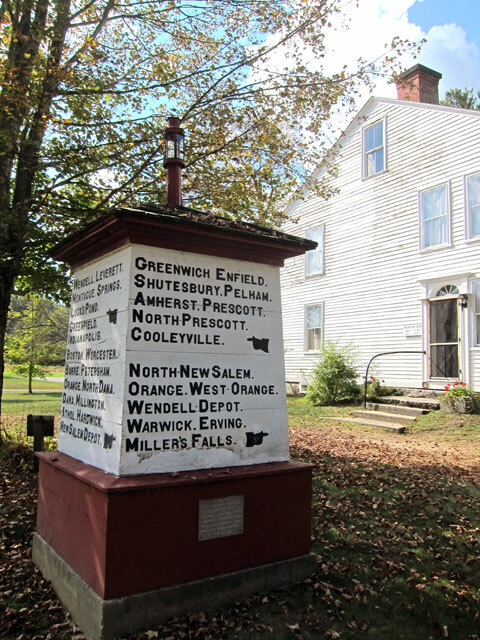 This is one of the original road sign posts from one of the towns. It was recently restored. 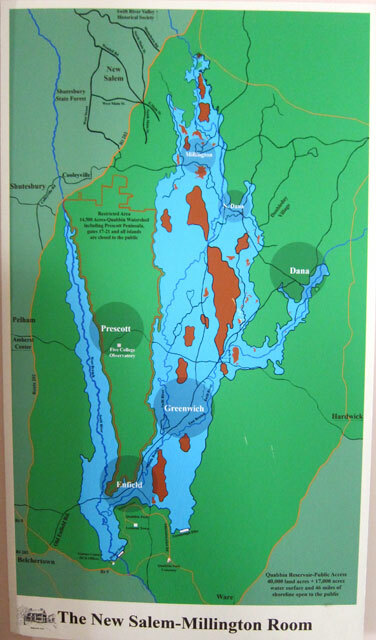 Below is a map of the reservoir showing you the location of the towns that disappeared forever. here is the original kitchen in the Whitaker-Clary House. 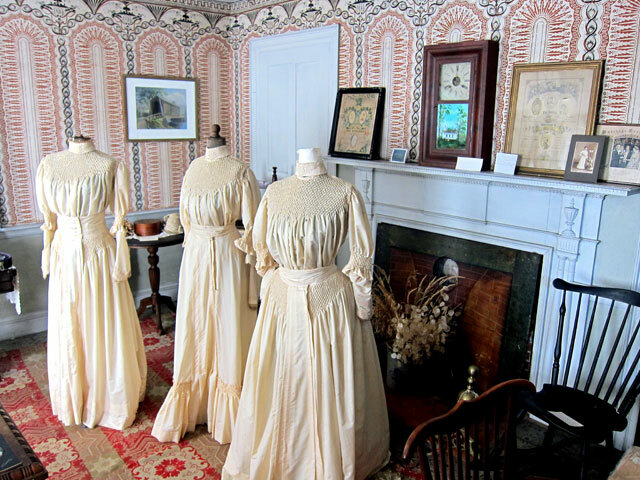 In the front parlor are these three wedding dresses. All the same, worn by three sisters married the same day in the same ceremony. 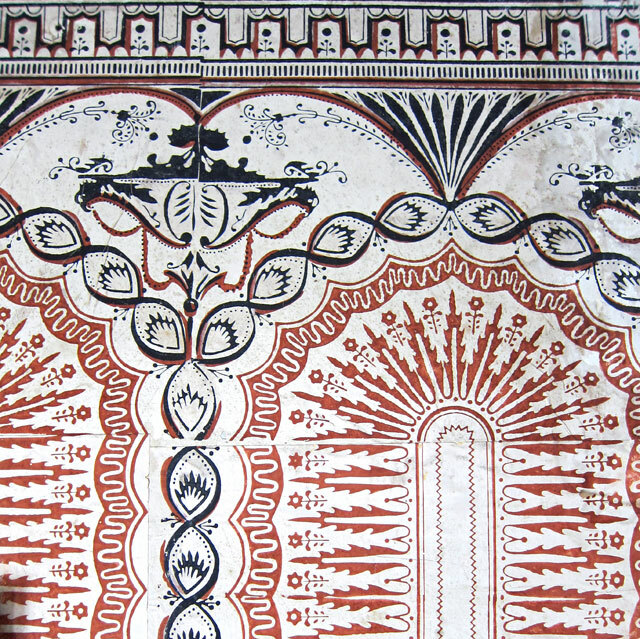 and detail of the great original wallpaper in this room. 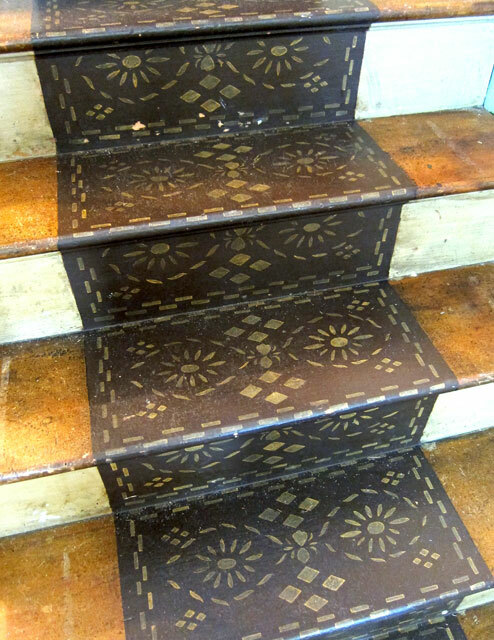 going upstairs, I now have a new plan for my home, which is ten years older than this wonderful house/museum. In one of the front rooms upstairs is the Dana room (each of the lost towns has a room dedicated to it with momentos from the town). and, a newly constructed barn structure has signs and artifacts from the towns. 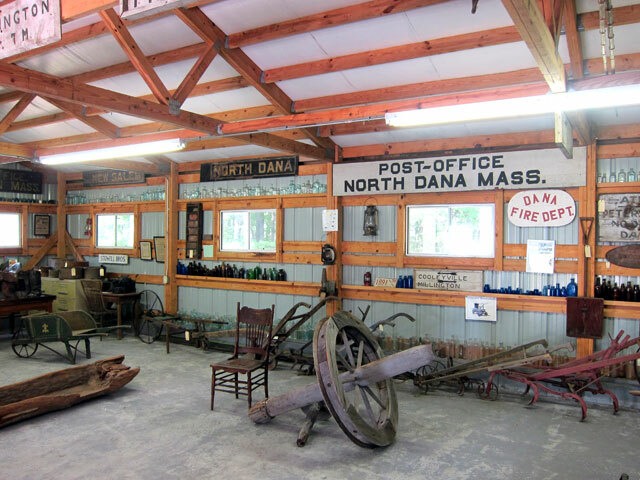 The North Dana Post Office sign was found just weeks ago and gifted to the museum. I have driven through New Salem a number of times, and just love it. Ironically, the museum is a tad north of the “village” which is why I have missed it. There is essentially just Main Street in New Salem (but I just did see on Google Maps a few roads I have missed – next trip). Here is the Common in New Salem. around the common there is a former private school (now a residence) and an early church. How cannot you not love this drive down a “dead end” Main Street? 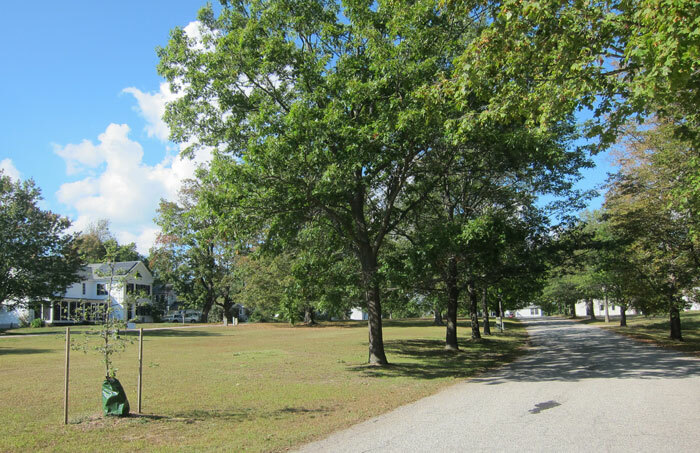 Main Street ends (after turning to dirt) at a gate to the Quabbin grounds. 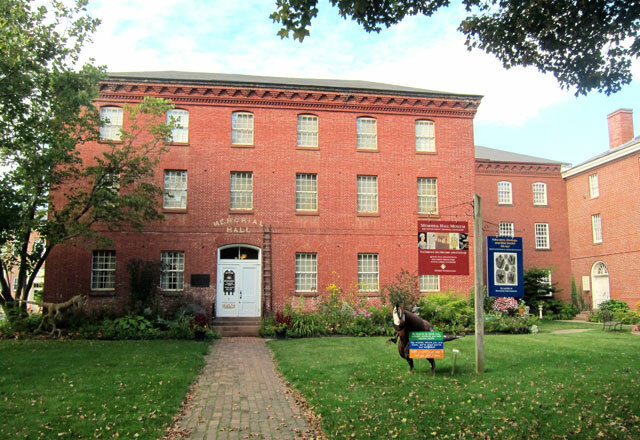 Part of this long day was to hopefully get to see the Memorial Hall Museum in Old Deerfield. Closing at 4:30, I knew it would be tight to get to finally visit, but off we headed – back roads across country, of course. Getting there 10 minutes before closing time, we still went in. Hey, if you are nice, you get to see something. And, we got a quick look at a couple rooms, an introductory talk, and a peek at the gift shop. 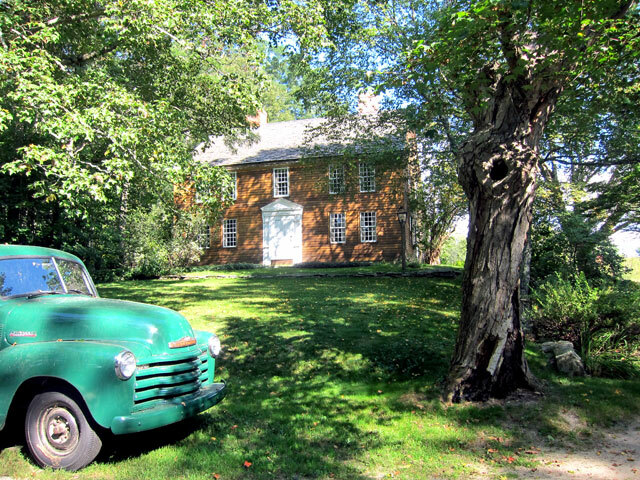 Two to three hours will be needed to do the museum justice, so still “on the list.” And, finally, “on the list” for the day was dinner at the Whately Inn, in Whately, of course. 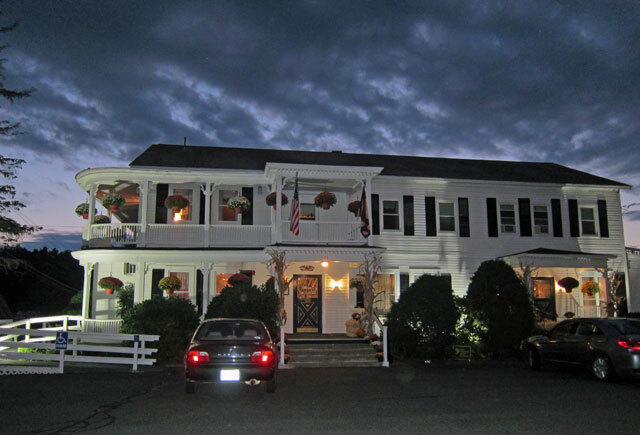 I had hoped to do this trip with an overnight on Saturday night and run hard on Sunday, but every place I called (that I would consider staying at) was booked, including the Whately Inn. Once entering, I realized that I would not have enjoyed staying there overnight, and the dining room was not decorated as it should be, BUT the food — plan on stopping for the food. Dinner is four courses, and reasonable. Appetizer, salad, entree, and desert. Here is my marinated mushroom appetizer, and lamb. I brought home the next night’s meal. — At a minimum read QUABBIN: THE ACCIDENTAL WILDERNESS by Thomas Conuel. There are so many interesting environmental facts and balances of life from the development of the area. 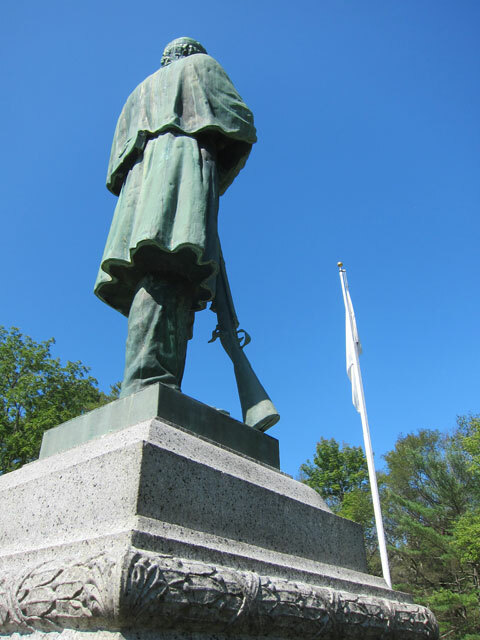 — Stop anytime in Old Deerfield. I have been touring through for over 54 years. — Report back to me with your comments on these recommendations. This entry was posted in Day (or maybe two) Trips and tagged Belchertown, MA, Mass., Massachusetts, Memorial Hall Museum in Old Deerfield, New Salem, Quabbin Park Cemetery, Quabbin Reservoir, Quabbin Tower, QUABBIN: THE ACCIDENTAL WILDERNESS, The Swift River Valley Historical Society, WATER FOR GOTHAM, Whately Inn. Bookmark the permalink. Great day Ray, thanks for letting me ride along shunpiking with Ray! Reading about it is just as much fun and made me appreciate have “done it”.